In 2271, Hull number 2000 is put forward in answer to Starfleet Proposal 342334 for the latest model of heavy cruiser design that will form the backbone of Starfleet's multi-platform fleet going into the 24th century. Specific mission parameters are carried forward from the original Constitution-class concept and enhanced to reflect in the changes in the nature of interstellar relations, the increases in distance along and outside of the Federation frontier, the increase in mission duration as a result, and the need for cutting-edge technology for sensors, passive (shields) and active (weapons) defences, diplomatic and scientific capability, etc. It is decided early on to mate this project with the highly promising Transwarp Project currently under parallel research programs at the Vulcan Science Academy and networked universities on Earth, Hamal and Deneb Kaitos. After almost losing the newly refitted NCC 1701 U.S.S. Enterprise down a wormhole when her engines went into antimatter imbalance, the Transwarp Project uses the data gathered by the ship’s computers during this incident to enhance their research. Transwarp drive was to be Starfleet's attempt to allow a starship to travel far faster than had even been predicted before. New engineering advances allowed the designing of a warp core reactor with over 10 000 times the power of the Constitution-class equivalent. Soon it became apparent that NX 2000 was to be the testbed for more than just new sensor systems and new engines. By the time the spaceframe was under construction in the late 2270s, nearly every starship system to be installed in her was to be new and experimental. NX 2000, U.S.S. Excelsior, was launched on Stardate 8095.5 (Earth Calender Year 2284) from the San Francisco Orbital Yards. Excelsior entered her period of testing, which would last for 6 years. Capable of warp speed, the ship would have to be fuelled with antimatter to go to warp and she will be limited to thrusters and impulse for easily half of the fitting-out period. At present, she has only 20% of her internal volume fully completed. Though control systems are in place, weapons, science sensors, crew quarters and such like have still to be installed. Every possible test was carried out by the Research and Development team onboard NX 2000. Her computer was tested for speed and number of systems it could run autonomously. The Artificial Intelligence installed in the computers was of a whole new generation and Excelsior was the first starship that could fly herself. Excelsior was assigned the best that Starfleet could offer her: Captain Styles, the captain who had more test hours than any other at that time, now currently the Head of Starfleet Research and Development. Commander Richard Hawkins was the Chief Engineer and Transwarp specialist, briefly replaced by the more field-experienced Captain Montgomery Scott for a brief period in 2285, Hawkins oversaw the engines of Excelsior until the completion of the testing phase in 2287. The Transwarp project never achieved it's aim of attaining speeds of over Warp 10, however it did directly lead to a new generation of warp drive engines. In 2290 the Excelsior was given her NCC designation and command was handed over to Captain Hikaru Sulu. When the programme was first set up in the late 2270s it was envisioned the first ships after Excelsior would be named Columbia, Paris and Roma. This changed with the decision by the Starfleet Commander, Admiral Harry Morrow, to decommission early series Constitution class starships. After a public outcry is was decided to reuse names from those famous decommissioned ships on the new class of explorers. In 2285, after NCC 1703 was decommissioned, the name Hood was resurrected for the second Excelsior class hull. The Third Excelsior hull was named for Yorktown, the ex-NCC 1717 had been decomissioned in 2285, only for events to see her refit and re-commissioned as a stopgap NCC 1701-A for Captain Kirk and his crew. It was felt Kirk would prefer a familiar ship and Montgomery Scott had denounced the new Excelsior design. In the event, Enterprise-A would last until 2293 when she was replaced by Excelsior class hull number 5. The testing of Excelsior's new systems and transwarp drive were intended to cover no more than two years. The intended in-service date for the design was 2286, with four hulls to have been underway or completed by this point. Vessels 1-4 were designed and constructed including transwarp drive, the second vessel - Hood - was intended to be launched and in service by 2285, but issues with the transwarp drive from early on meant the hull was delayed whilst Commander Richard Hawkins and other ASBD engineers worked on a solution. After Excelsior was launched in 2284, work commenced immediately on the third hull, Yorktown. Clyde Fleet Yards work tirelessly to get Hood operational and she joined the fleet in 2287. Time was not on the side of the Transwarp Project and it was cancelled in 2287. Extensive re-designing and re-working of the engineering hull had already commenced on Hood and Excelsior followed. Renown and Repulse were modified in the yards; all successive hulls would now have the modified non-transwarp drive. Hull #5 was redesigned from construction commencing in 2288 and emerged as the Enterprise-B in 2293. The programme had been delayed four years by the Transwarp drive assessment and subsequent rejection. However, all was not lost and significant gains were made with the new warp drive system. Once a decision was made on transwarp, the low-rate initial production (LRIP) was expanded to full production of the design with some of the names and registry numbers chosen in the 2270s being used on the new hulls. 2000 Excelsior 2284 Prototype. The Excelsior was reported lost with all hands in 2308, near the Tzenkethi border. 2541 Hood 2287 As seen in ILM images from TNG: Encounter at Farpoint. Second Excelsior class vessel constructed at Clyde Fleet Yards. Named as Hood in honour of previous vessel NCC-1703 which was lost in 2285. Was to have been named Exeter. 2544 Repulse 2289 Named for the WW2 battlecruiser and Polaris submarine. 2545 Renown 2291 Named for the WW2 battlecruiser and Polaris submarine. 1701-B Enterprise 2293 Prototype 17th Generation starship [designated Generation 16+]. Fifth vessel of the Excelsior class constructed from 2288 - 93 (Haynes USS Enterprise Owners Manual). Third of class assembled at San Francisco Fleet Yard. 2573 Roosevelt 2294 Named for Theodore Roosevelt (26th) and Franklin D. Roosevelt (32nd), Presidents of the USA. 6212 Albion 2295 First 17th Generation starship. Named for the commando carrier and assault ship. 6213 Bulwark 2296 Named for the commando carrier and assault ship. 2002 Columbia 2297 Named for the explorer ship of Captain Robert Gray and the Command Module of Apollo 11, also lost Space Shuttle Orbiter OV-102, and previous named Hermes scout class NCC 621. Simulation of original ordered Excelsior names until superceded by popular demand to restore the Constitution class names. Later constructed once Transwarp programme cancelled. 2008 Paris 2298 Starfleet Academy. Simulation of original ordered Excelsior names until superceded by popular demand to restore the Constitution class names. Later constructed once Transwarp programme cancelled. 2009 Roma 2299 Starfleet Academy. Simulation of original ordered Excelsior names until superceded by popular demand to restore the Constitution class names. Later constructed once Transwarp programme cancelled. named for the Italian WW2 battleship. 13958 Okinawa 2302 First vessel of Production batch 2. 14124 Vanguard 2303 Named for the 31-gun, 56-gun, 90-gun, 70-gun, 74-gun and 78-gun sailing warships, battleships of St Vincent class and last battleship of 1944 and the first member of the Vanguard Trident Submarine. 14221 Farragut 2304 Registry taken from Memory Beta. 14427 Lexington 2305 Named for the aircraft carriers CV-2 and CV-16. 14455 Vikramaditya 2306 Named for the Indian aircraft carrier. 14598 Fearless 2306 Named for the Falklands War assault ship. 14660 Queen Elizabeth 2307 named for Elizabeth I who built up the navy of England and the battleship and aircraft carrier. 14783 Krasin 2309 Named for the Russian Icebreaker..
14816 La Fayette 2310 Named for the French stealth frigate, US aircraft carrier and submarine. 14881 Graf Zeppelin 2311 Named for the airship designer and German aircraft carrier. 14902 John F Kennedy 2311 Named for the 35th President of the USA, the unique class supercarrier and the Gerald Ford class supercarrier. 14934 Tecumseh 2312 Named for the American Civil war monitor. 14957 Victorious 2312 named for the British aircraft carrier and Trident submarine. 18253 Potemkin 2313 Named for Constitution class NCC 1657. 18297 America 2313 Named for Constitution class NCC 1847, the aircraft carrier and amphibious assault ship. 18309 Hyuga 2314 named for the Japanese helicopter destroyer. 18334 Richelieu 2314 Named for the French WW2 battleship and seventeenth-century statesman Cardinal de Richelieu. 18392 Aurora 2315 Named for Shackleton's supply ship and the Polar survey ship Aurora Borealis. 18444 Tiger 2316 Named for the battlecruiser HMS Tiger, alleged to be even more beautiful than Hood. 18562 Eagle 2317 Named for Constitution class NCC 1685 and british aircraft carriers (1918) and 1946. 18618 Invincible 2318 Named for the Falklands War veteran aircraft carrier HMS Invincible. 18709 Oriskany 2319 Named for Essex class CV 34. 18733 Canberra 2320 Named for the capital city of Australia and P & O liner from the Falklands war. 18991 Iron Duke 2321 Named for Admiral Sir John Jellicoe's flagship at Jutland and Type 23 'Duke' class frigate. 18997 Mandela 2322 Named for the former President of South Africa. 20045 Yorktown 2323 Registry from TNG: Measure of a Man. Successor to the Constitution and Excelsior class vessels. 21445 Excelsior 2324 From TNG: Measure of a Man. Named for the prototype. 21534 Excalibur 2325 From TNG: Measure of a Man. Named for the lost Constitution class. 25330 Endeavour 2329 From Okudagram in TNG: Measure of a Man. LE: "Wells of Souls." 34099 Livingston 2330 First vessel of Production batch 4. 38860 Kongo 2332 Named for the Japanese battleship. 38907 Intrepid 2333 Named for the Falklands War assault ship. 42296 Hood 2339 Named for the British battlecruiser. Replacement for lost NCC 2541. 43118 Carpathia 2345 ST: Online and Titanic rescue ship. Mikasa 2347 Named for the flagship of Admiral Togo Heihachiro - Nelson of the East. 52043 Melbourne 2350 This NCC number is a compromise, given the 62xxx registry is blatantly for a Nebula class vessel. Firstly, may I thank Scottish Andy for his history of the Excelsior class and NCC number commissioning date generator program which has helped to put dates to these starships. These have been spaced out in a few places to give a fluid lineage and additional ships have been added in the 18000 range for when the Constitution class are retired. Note: this is not an exhaustive list, plus names and registries can change without warning due to canon details emerging or story requirements. Figures for the size and construction times for the Excelsior class have been devised from the equivalent data for the U.S. Navy Nimitz class nuclear aircraft carriers [vessels of approximate size to the Excelsior class]. The gap in NCC numbers with Albion shows the change from 16th to 17th generation starship technologies. From the figures quoted, the eventual full size of the Excelsior class will be around 50 hulls, the last being in the NCC 43xxx range such as U.S.S. Valley Forge [a vessel still in service at the time of Star Trek: Deep Space Nine]. Obviously should any canon sources contradict these fleet numbers, this page will be updated. With the Haynes U.S.S. Enterprise Owners' Workshop Manual by Ben Robinson, Marcus Riley and technical consultation from Mike Okuda, just such a change occured. Page 80 clearly note that the Enterprise-B was constructed from 2288 - 2293 and was the fifth Excelsior class starship built. Transwarp is established as abandoned in 2287 and the project was 4 years delayed when Excelsior entered service in 2290, giving 2286 as the due in-service date. This also canonises that it takes five years to build an Excelsior. As Columbia and Paris were only seen as simulated ships in Starfleet Academy, I propose these were the intended first names before the old Constitution class names were revived. These Academy names would come after Enterprise-B to preserve the fact that she was fifth built after Yorktown (mentioned in Flashback), Hood (Shown to be NCC 2541 in Encounter at Farpoint with Transwarp configuration) and Repulse (shown in The Child as last appearance of Transwarp-configured Excelsior filming model). 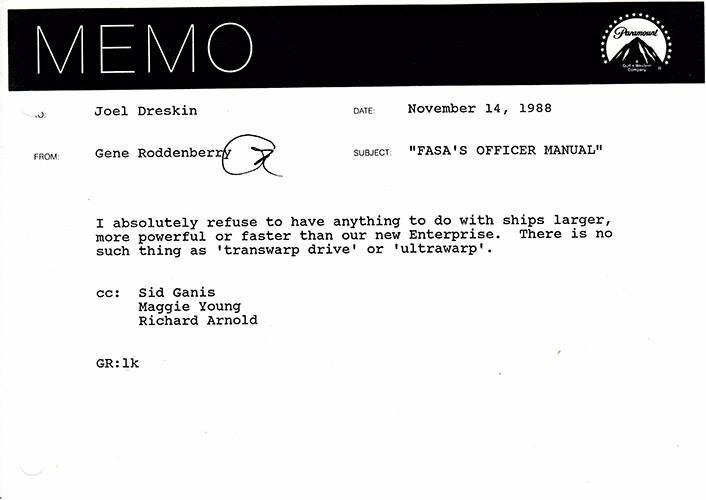 Gene Roddenberry sent a memo on 14 November 1988 (see left) in which he emphatically said there is no transwarp drive. Althoug his appears to be denouncing the existence of the larger Excelsior and her advanced warp drive system, this memo was actually sent to FASA about ships larger and faster than TNG's Enterprise-D. Excelsior is safe, her fancy computer-controlled warp drive not so much. Although advances made from the Transwarp research programme helped to create advances in warp drive that increased the speed and efficiency of Starfleet starships across the board. With the re-tooling of construction yards for the new NX 10521 Ambassador class project, so the Excelsior class construction chapter comes to an end in the early 2320s. This reflects the re-tooling of Newport News yards in moving from the Nimitz class CVN-68 class to the new Gerald R. Ford class CVN-78 class. In simple terms: it doesn't make sense to be building Excelsior class when new generation Ambassador class are to be built. Service Life Extension Programs (SLEP) and upgrades will keep the yards busy with Excelsior class for decades to come. Actually in light of Star Trek: Online this will be over a century. Thanks to Curt Danhauser for his Excelsior enthusiasm and Bridge station guidance.